I'm a facts- and data- driven person, as one could easily surmise from my background. So, when someone throws out comments like "lazy Greeks" I go looking for the numbers. Surprise, surprise... (click to enlarge chart). 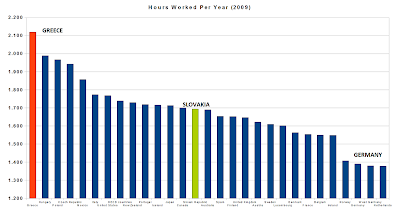 According to the OECD Greeks work 2,119 hours per year - that's 25% more than Slovaks (the commenter referred above said he is from the Slovak Republic) and a whopping 52% more than Germans. Looks like the populist myth of Greeks lazing and dancing by the seaside, drinking ouzo and munching on souvlaki is solidly busted. I share your aversion to cliches/generalisations, but the argument would be even more convincing if it were productivity figures and not just pure work hours. Do you know how they all compare on that front ? Productivity is completely different from laziness. It has to do with, amongst many, many other factors, capital investment (e.g. innovation and technology), infrastructure (roads, rails, ports, telecoms, energy..), the regulatory and bureaucratic environment. If Greece was #1 in productivity - which it certainly isn't - it wouldn't be nearly bankrupt, of course. CHILE IS MORE PRODUCTIVE THAN GREECE AND ALL EUROPE. Work hours is just work hours. lol its not productivity. countries that are productive actually have a small debt, cause they work and pay it back. so Chile is the most productive country in the world with public debt only 6%. We Greeks have inferiority complex so we like to misreport official statistics so we may look cool. its true its painful to say but its true. I can't be sure about the quality of Greek data, of course, but I point out that Greece has the highest self-employment ratio in the world (again, OECD data). 31% of all men are self-employed and 16% of women, vs. avg. of 17% and 8% respectively for the OECD. Obviously, self-employed people tend to work longer hours. There is nothing busted here. Lets get a few "facts" as you would like to put it straight. - Greece has been caught out lying about its statistics. So how can you even believe that these numbers of hours worked are true. Especially when you are using data during the years that we all now know is fraudulent. - Productivity is very important as far as those hours worked are concerned. Now it is clear that you, Hellasious, have no idea of what real productivity is, and I'm not talking about the numbers you read in a report which basically means nothing these days. If you had ever been to Germany and to Greece you would know what I mean. 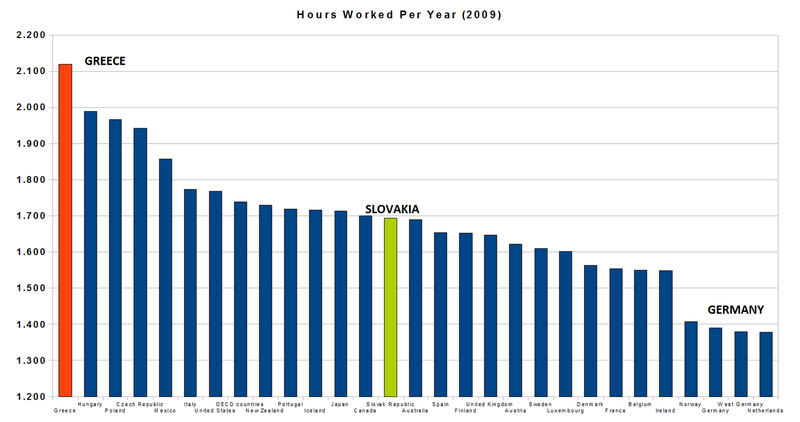 Germans work very hard during their hours at work, while Greeks don't. Greeks do very little during their hours. The Germans have a very strong work ethic. If you know anything about Germans, they are notorious about working only during regular hours, over time is something they don't like doing. But while at work, Germans are like machines, they work very hard. Note: I say the above as an Italian who also admits we in Italy too do not work as well as the Germans. - Furthermore, Hellasious, you seem to like cherry picking your data! You missed out most of the debt, like in the unfunded liabilities. If you really want to speak about the facts Hellasious, I suggest to try being a little more prudent with reality first! It is exactly this kind of nonsense, and it is nonsense, that gets peddled by people who spend to much time at a desk in front of computer, and not enough time seeing the real world with their own eyes. I don't need a chemical engineer pretending to be an economist, who has never seen the difference between a German run company to a Greek run company, telling me how to read cherry picked data, all because he has an ulterior motive to protect his Greek heritage, with shoddy analysis. If I want this kind expert analysis, I can find plenty of it on Wall St, US Fed and at the European Union. Not to mention also in my own incompetently run country, Italia, despondently I say. You used to do some good work Hellasious, but in the recent while, like in the past year, your work really has become shoddy. My Italian opinionated reader, I don't cherry pick data. I present them as I find them. 1. Unfunded pension liabilities are not included because they are entirely subjective. If you know anything about them you will understand that they can vary enormously depending on what assumptions are made about annual pension fund returns, retirement ages, etc. In any case, I don't include them for ANY nation, so the comparison is the same for every nation. 2. If the Greeks lied about their statistics, so be it. But the analysis stands and I should point out that Eurostat has now removed all reservations it had on the quality and veracity of Greek data. 3. Productivity is important, no doubt. But my comment was directed to the Slovak reader who said that Greeks are "lazy bums". 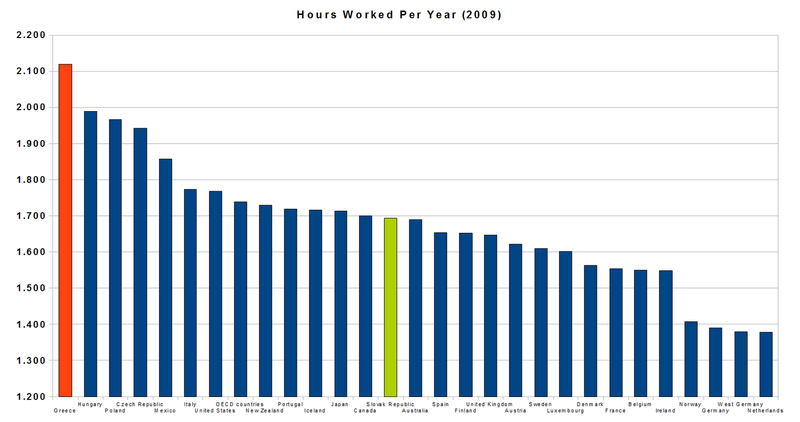 You can't be at work 50% more hours than Germans AND be lazy at the same time. Finally, you have it backwards. My professional chemical engineering days ended in 1984 and I have been in finance ever since. Oh, and I bet I travel internationally one heck of a lot more than most people. I even have been to Italy. Many times, in fact. Makes me wonder how this data was obtained. Productivity and laziness are different, though possibly linked. I can clock in many hours with low output, does that make me hardworking just by the sheer hours? Quantifying hardwork by "working hours" is a lil' oversimplified. What is astonishing is Japan is in the center. And I always assume that they worked long hours, to their deaths. IMO, data is suspect. Productivity has mostly to do with WHAT you are producing during the hours that you work. If your economy is focused on high value-added products (e.g. Germany) then productivity is very high. And value added is connected to capital investment (technology, innovation, etc. ), as well as infrastructure investment (communications, transport, education). Greece, and many other countries like it, produces mostly low value-added products and services and has a bloated public sector, as well. But that doesn't mean that Greeks are "lazy bums" (my original point). What is needed there is a massive revamping of their economy. As always, I recommend green/sustainable investments as the best and fastest way to increase productivity and economic success. Agree that productivity is influenced by a lot of factors that have nothing to do with the 'measurement' of laziness. However, I personally feel that work hours alone maybe aren't a good indicator either. Liked your myth busters theme though. I'm certain the Greeks aren't as bad as they are being portrayed right now, as much as not everything is fantastic in Germany. hi have u heard of singapore, the rich tiny southeast asia nation(or is it city)? lowest productivity and highest number of hours worked apparently. why the difference? Here's the trouble with productivity: it's essentially a ratio of GDP to hours worked. So, if you work long hours (i.e. the exact opposite of being a lazy bum) then your productivity is low, all other things equal. The important thing to watch for in an economy viz. productivity is its structure: is it capital or labor intensive? In capital/technology intensive economies (eg Germany) productivity is high because machinery and knowledge replace workers. The denominator of the ratio is low, thus the ratio itself is high. In lower tier service/agri economies (e.g. Greece) more workers are necessary, for example in order to make beds in hotels and serve meals. The denominator is high, the ratio is low. I would be very interested to see a study of national economies that measures and compares some sort of return on invested equity (ROE), instead of "productivity". I have a solution. Trading Places for states. Replace Germans with Greeks in their respective countries. The Germans learn to relax and enjoy life more. The Greeks learn the knowledge and gadgets involved in highly productive economies. The USA wins by producing and airing the show. Long time no write. I stepped away after Thai passed. I had a guilty conscious for a while, sitting there debating with a dead man in his final days about something as silly as Zero sum. All that kept going through my head was: I hope I didn’t keep him up late night replying to me (when he could’ve been getting more sleep) or the fact that he wasted hours debating with me that could’ve been spent with his kids… etc… It hit me pretty good. Anyhow, I just popped in and read some of the comments. You really drew one guy’s ire! Please disregard ignorance. (I’m not calling him ignorant. I doubt he is, as he’s here which probably means he’s finely tuned.) I mean ignorance in the sense of not knowing how hard it can be to be so highly relevant all the time. Is this your best work??? I don’t know? Is this your worst work? Who cares? It’s all arbitrary to the reader and the writer of the moment. When you were writing about CDO’s back in 2006-2007 I’m sure many readers were thinking about how unimportant your work was then… …but in hindsight we know different. Kind of funny, but 2 years from now, maybe we’ll be talking about how Greece was the first trigger of a recovery based on employment, hours worked, taxable income etc… ??? …and we’ll be saying, Hell nailed it again. Anyhow, nice to see that you’re still at it. I have a hard time dedicating any energy into writing or researching markets that are as fixed and engineered as “professional wrestling”. It’s still my favorite analogy. (Picture arguing seriously about who’s a better wrestler: Hulk Hogan, Andre the Giant or The Sting. …and then step outside your body, and look back at yourself and laugh at the idiocy of wasting time and effort on something fake. …and then laugh even more the you are an “expert” in this field.) Well that’s how I’ve felt about modern finance, thus my death as a writer. Hope all is well and happy 2011. Oh, geez. I got sidetracked in catch-up and forgot to bring up my relevant point. I’ve worked in NYC my entire life and don’t have the highest opinion of our workforce, but I do have some respect for it. (Not the best, not the worst) In addition, I’ve spent the last 5 years at an Asian institution which was a big change from my BNY days. …and my friends told me something that stunned me. The first thing they told me was about how the asian community was 9-5, and that’s IT!!! Which is why their trains are so jammed at 5:01. They insisted that, they worked hard, but nothing like the stereotype. …and they also said, the willingness to “get a job done” where you have to gut it up, and work extra was non existent. I was like… HUH!?!?!? In hindsight, I see what they mean. They said, England and some California places were the only others that ranked. Europe and Asia were distant 3rds. Now keep in mind… there is no science to this study. These are just the opinions of a bunch of Bloomberg guys I used to hang with. …and since Bloomberg is Finance, most of the places that have intense finance industries probably drive the most pressure and work. Either way, I thought you might find it interesting? Thanks Rich, a pleasure to see you back in town. As for the work ethic, I had the same experience as you did/do. Unquestionably, finance (and law) in NYC must be the most grueling workplace in the world. I still remember my training days at Merrill in NYC.. we were required to be there 8 AM - 8 PM. Saturdays were work days, but we got to go home "early" after 4 PM. Those who didn't "volunteer" to work on Sundays were considered wimps. Essentially, The few, The proud, The Marines...so help, us.. Flash to Frankfurt... even in finance, and I mean trading desks at major banks, it was STRICTLY 9-5. We were putting calls into Commerzbank FFT at 5.05 pm local and no answer on the phone or the Reuters dealing. Hey, Rich! Welcome back! I was thinking about where you had gone last week. Must be something in the air. Anyway, regarding how hard people work: the United States, besides the only country in the industrialized world that doesn't guarantee health care for its citizens, is also the only one that does not guarantee vacation time, sick leave, maternity leave or retirement (even when you have a pension, since it can be taken in a bankruptcy). And for some workers in this country, they are not even guaranteed the pay they are promised, or overtime pay, or vacation time, or sick leave or any other benefits even after they have earned them. See this article: Wage Theft Is Rampant in America -- Is Your Boss Ripping You off? We used to have a rule of law that enforced contracts; but corporations now make calculations on how many people will sue to enforce them, and how many will succeed and how much it will cost to get to court versus how much they will recover versus the "cost-benefit" of recovery if they do. Just when will workers in this country do their own "going Galt" in response to the denial of pay and benefits for the work they do? Or are we turning into the old Soviet joke: "we pretend to work and they pretend to pay us." Anyway, when you were here last time Rich, we were just starting to discuss anarcho-capitalism. Believe it or not, this economic-political theory is being taken seriously by the newly empowered "Tea Party" Republicans and Libertarians. I'm just wondering how long it can stretch before the rubber band of productivity and labor breaks? The main problem I see with anarcho-capitalism is the Tragedy of the commons. The problem with "going Galt" I think is the power, established in our highest court, of the corporation. The leverage corporations have over the workers, now with at least 10% unemployment, together with the leverage they have over government, is fearsome and will be used to crush any "Galts." The propaganda machine is another tremendous barrier. How often do you get the ring of truth from the MSM anymore? Michelle Bachman (the leader of the Tea Party in the House) wants to roll back regulations on corporations? Is that one of our major problems, restrictive regulations on big banks? Speaking of myths. How does the supposed coming hyper-inflation people talk about, happen with the power over wages corporations now have? Will corporations cooperate with rising consumer prices by increasing wages to meet them? I don't think so, not in the short term, and not in a 10% unemployment world. I'd be interested to see the breakdown of these figures in the private sector. I suspect the Greek numbers are padded by Government employees who are superficially putting in long hours. Productivity numbers use hours worked as a divisor, so you can't really seperate the two. It does not make pretty reading! An interesting post by a Serbian working in Washington, D.C., on the Huffington Post: Workaholism in America: A European's Perspective. Also, for those of you reading from outside the United States, at this hour there is breaking news of a Congresswoman and Federal Judge that have been slain with a semi-automatic rifle in Arizona. I just read your article is greece bankrupt? A few stats I found that might be relevant and come from 2011's budget. Greece will pay 16bn in interest and 33bn in pensions (6bn public pensions included) Thats a total of 49 bn. Its revenue is a little over 50 bn. Its budget to GDP ratio is 1:2. Dont these numbers make the country bankrupt? Pension income (i.e. payroll contributions) are not included in the figures you supply. The state does provide a subsidy to the public pension scheme but it's not that much. I'm sorry. Pension income for Greece is 23bn. So you have 16 bn in interest, which is the amount that Greece will spend for education (5), health(6) and defence (5). This fact alone seems extremely troubling. Increase state revenue to the Eurozone average of 44% of GDP from 38% today. In money terms, that's an extra 14 billion/yr. Bring the bigger part of its shadow economy into the open. It is estimated that an additional 27% of reported GDP is hiding in the shadows, vs. about 11% for nations such as France, Germany, etc. If Greece gets there, that's another 37 billion added to GDP, and if the government gets 44% of that as added revenue, that's another 16 billion/yr. Total: 30 billion/yr in ADDITIONAL revenue. The entire budget deficit for Greece in 2010 was 20 billion. These are, of course, extremely difficult targets. However, they also point out that Greece is not only viable going forward but can seriously thrive should it put its house in order. As other have stated, this is a productivity issue. The GDP stats are of course biased by the fact that c. 25% is lost to grey economy that doesn't show in the official GDP. However, even after corrected for this, it means that Greeks are not very productive esp. compared to Germans. Does it mean they are lazy? I do not want to pass judgments on people as a whole, but purely from a statistical point of view the answer is yes/no/maybe. You can work very long hours, but very leisurely. Some call that laziness. Or you can work very long hours, and very hard, but not very wisely (i.e. low productivity), but most would not call that lazy. So, the term lazy is a misnomer not least because it can be so misleading. However, it does look like on the average, the greek working population is not nearly as productive as many other European working populations. it seems in WSJ they r reading you, with some delay i might say.